While it is a good thing to handle your pet, remember always to support the full body. Don’t just let it dangle from its “armpits” as the cat will resent this, and may possible struggle or even bite. The beginning of a beautiful life-long friendship. It is important that children learn the proper handling of family pets as early as possible. Pick and adult cat up by putting one hand under the chest just behind the “bottom”, tucking the tail in. Once up, let it sit in the crook of your arm with its forepaws on your shoulder or held in your other hand. Kittens should be handled especially carefully, as their rib cages are very soft and they can easily bruise internally if roughly treated. Although queens pick up and carry kittens by the scruff of their necks, you should avoid doing this except for brief periods when grabbing cats that may be uncooperative or agitated. Scruffing a cat by taking firm hold of the loose skin at the back of the neck doesn’t hurt the animal, but it is a rather undignified procedure. Where a cat has had an injury to its body particularly a fracture, “scruffing” is allowable. Cats are neat and nimble, and housing them indoors doesn’t present the problems associated with dogs. They can, where necessary, be kept permanently indoors and will happily adopt as their territory event he smallest apartment. Some breeds are particularly suited to this cloistered life. Earlier I mentioned the basic equipments and coping with scratching are the two principal items that need to be given further special attention. It is important to spend some time, particularly with younger cats, in teaching them how to behave. The earlier you begin, the better. When kittens first start to eat solid food at three to four weeks of age, toilet training should be introduced. Place the litter tray in a convenient, easily reached, but quiet spot and, as soon as the animal looks like urinating or defecating (easily spotted as they crouch, tail raised and with a certain faraway look in their eyes), pop them on it. Never rub a kitten’s nose in any “mess” that it makes. Felines are clean and train quickly. Very old cats may become forgetful or lose control on occasion. Bear with them. A litter tray should be made of metal or plastic and be large enough for the cat to stand in. It should be lined with newspaper and then covered with a 4cm (one-and-a-half inch) deep layer of peat moss or proprietary cat litter. Ashes can be used, though they are rather dusty. Sawdust is messy when dry and quickly becomes soggy and smelly when wet. Remove the soiled litter daily and clean and disinfect the tray weekly, using any household disinfectant except those containing phenol, carbolic acid or any coal-tar chemicals; these can poison cats by absorption through the skin. Rinse a disinfected tray thoroughly. 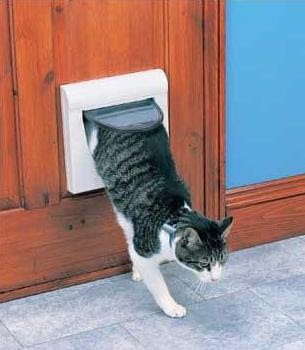 To train a cat to use a flap, begin by fastening the flap open and allowing the cat to familiarize itself with the hole. Then, use bits of food to entice your pet through the flap, helping to push it open. It will learn quickly. All cats should be thought to recognize their own name. Use it regularly, particularly at feeding times. Make a point of having regular set times for feeding, grooming, etc. Cats can be trained to do little tricks like begging for food but this can only be achieved by kindness and reward in the form of tidbits of favorite food, and always depends on the animal being in the right mood. You can’t force cats to do anything against their wills. Nevertheless, it is possible to dissuade them from undesirable habits like biting or jumping on people. From the earliest age, firmly but gently pick up the cat, place it on the floor and say “No”. Some anti-social behaviour will be reduced if the cat can be allowed out of doors or given a scratching pad. Left pic: A typical cat scratch post – it looks tempting and will probably save wear and tear on your antique furniture. Scratching is, in more ways than one, a very touchy subject, particularly if your cat has no eye for interior decoration and takes it out on your Louis Quinze escritoire or the sofa that was your mother-in-law’s wedding present. The answer is to provide a substitute scratching object of the right texture to give the cat the most satisfactory “feel”. A log complete with bark, a vertical post on a stand wrapped in coarse sacking, or one of the compressed blocks of corrugated paper sold in pet shops will do. Cats have to be trained to use these devices. At the first sign of Puss contemplating the furniture, grab him and take him to the official scratching point. With a little patience he will get the message. Surgical removal of a cat’s claws under anaesthetic by a veterinarian is possible, but such mutilations are illegal in Australia and Great Britain, and frowned upon in New Zealand. A special bed in a box or basket can be provided if you wish, but its not absolutely essential. Most cats pick their sleeping places around the house quite independently. Young kittens should, however, be given a box (a simple cardboard one will do) in which they can sleep snug, draught-free and out of harm’s way. A lining of newspaper covered by a piece of blanket that is changed regularly should be placed inside. To avoid contamination, never feed a kitten in its sleeping box. Why don’t I believe in having my cats sleeping with me? Cats, like any animals that live close to the ground, sniff each others’ backsides, investigate drains and can be too intimate with germ-carrying rodents. They are more likely to transmit infections to humans if draped across the pillow eight hours out of every twenty-four. There may be a risk of suffocation of a very small baby if a cat is allowed into the room in which the infant is sleeping. A cat can be left alone in a house or apartment for as long as twenty four hours provided that adequate food, water and litter are left. If you are likely to be away from your home for longer than a day, arrange for a neighbor to call in regularly (once every twenty-four hours at least) to replenish food and water and empty the tray. Neighbors are preferable to catteries – there is less risk of your pet picking up disease, and the animal is not wrenched away from familiar surroundings. Luckily for some of us, cats don’t need active exercising by their owners, although it seems likely exercise is beneficial to the health. Kittens exercise themselves in play and will get endless pleasure and activity out of a ping-pong ball to chase around of a cardboard box to jump in and out of. 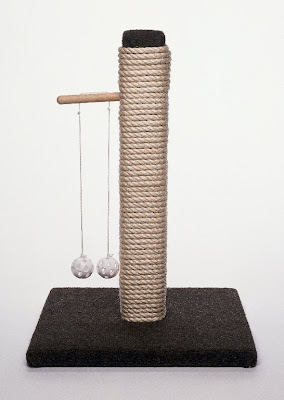 For the permanently house-bound adult cat, a climbing frame and scratching post should be provided. As I pointed out earlier, if you live in a high-rise apartment or near heavy traffic, your cat is best kept indoors at all times. Restless breeds that need to spend more time outside (Rex, Somali, Abyssinian) should be avoided for such dwellings. Although even adult indoor cats usually keep themselves fit by stretching and playing by themselves, it is a good idea, and fun, to play with your cat. Taking cats for walks on leads isn’t easy as taking dogs. Some cats object and they must never be forced to walk farther than they choose. Training a cat to a lead should begin early with a newly weaned kitten. Walks should at first be in the house, later in the garden and then, if things go well there, finally on the sidewalk. A long, thin, leather or, better, cord lead should be used for cats. Breeds that are more amenable to lead-training than others are Siamese, Burmese, Russian Blue, Foreign White, Foreign Black, Foreign Blue and Foreign Smoke.